"Orthodoxy is a freedom-loving, democratic faith it is at its best in our free America. Our people are part and parcel of America, gladly giving their treasure and the blood of their sons to safeguard its free institutions which are the reﬂection of the freedom they ﬁnd in their faith. If the best of Byzantium has survived, it is in the United States, and if there is an Orthodox political ideal, it is enshrined in the Constitution and the Declaration of Independence. "Thus, while we must still minister to many who remember the ways and customs of another land, it is our policy to make our Church in the United States, an American Church. In my own archdiocese, under my administration, we have pioneered in the introduction of English in our Services and sermons. From the beginning of my ministry, I began the printing of English service books, and the training of English-speaking priests. We are tied to no sacred language; we recognize all tongues as the creation of God, and employ them in His worship. We have no desire to perpetuate anything but the Gospel of Christ, and that we can do as effectively in English as in any other tongue." With these early words of Metropolitan Antony, it is no wonder that he remains one of the towering ﬁgures of the Antiochian Orthodox Church in the twentieth century. It is my task today to sketch for you what has remained as an important part of his enduring legacy: his administrative skills and how they advanced the cause of Orthodoxy on this continent. On the eve of his burial, we stood vigil in the Cathedral having witnessed a panoply of prelates march in with black robes and chant in a multitude of foreign languages, each individually, before Antony Bashir as he lay in state. The late Protosyngellos Ellis Khouri quietly nudged us and whispered: “In his death he till looms larger than most of these gentlemen in life!” The fact was that the shadow of Antony Bashir cast itself over a major period of our history. The presenter of such a wide and diverse subject must be immersed in both the period and the person to capture the contextual essence of the leader under discussion, that is, the times, his education, culture and circumstances. My own setting is one in which a second-generation Arab Christian born and raised in the United States, experiencing a Western Christian lifestyle, was totally captivated by the sweeping movement launched by Metropolitan Antony to come to grips with the problem of adjusting the a'ncient Antiochian Church to the modern world. As he once stated: “. . . . the troubled history of the Church founded by the Apostles indicates the constant miracle implied by its survival.” It was his mission to ensure the survival and progress of the Church in North America. As an emerging leader in the thirties, he seized the moment. “Lest We Forget,” he was in truth, for his time, something rare, a man deeply, almost domestically at home in the world. Driven by curiosity and energy, he did what he had to do without fuss. It strikes me now that this was an adventurous journey of the Church into the twentieth century. What follows is not an encomium about a holy Father, but a brief story about a man, “ﬂesh of our ﬂesh and bones of our bones, ” who without fear of intimidation embarked on an ecclesiastical career that altered the way of doing the “business” of the Church on this continent forever. Metropolitan Antony assumed high office in one of most turbulent periods in the Church’s history on this continent, internally as well as externally. The North American Church, while still badly injured from the years of intenecine warfare that followed the death of Bishop Raphael, still remained a viable force among the Arab Orthodox. Although the body was fractured, it was not permanently damaged. The Great Depression was receding as tensions overseas escalated to bring about the Great War. The vivid memories of Raphael, Aftimios, Germanos, Abou-Hatab, Abou-Assaly and their followers remained fresh, yet the resiliency of the Christian Orthodox community is a testimony to the vitality of their faith and cultural traditions, a triumph in the face of adversity. Hope was never lost for a new dawn . . . I was told many years ago by a witness to Metropolitan Antony's consecration, when he prophetically articulated his vision for the Church — similar to the one in my opening quote — that he was simultaneously applauded and vilified by the congregation in attendance. But he never veered off course in charting the future for the emerging generation of Antiochians. It seems that this utterance was almost autobiographical. Metropolitan Antony approached the Church as a “practical theologian,” having studied both theology and law. Over the years, I have scanned and studied his letters, missives, holiday greetings, Archpastoral charges and listened to recordings of his sermons. There is a fascinating element in the way in which he combined his theological intuition and training in a finely-honed legal framework. Because of this, a vast majority of his letters are terser written and to the point (usually at the bottom of the recipient’s original letter to him) and his published and oral presentations on the whole had a logical sequence. With his God-given gifts and very human qualities, what did he achieve from 1936 to 1966? While he started his ministry as a “one man show,” he later acquiesced to those men he inspired to establish what we now accept as normal in the Archdiocese. He ultimately possessed the genius which listened to the advice of his faithful lieutenants. He knew instinctively that he had to share the administration of the Archdiocese as it expanded, particularly with the young men returning home from the horrors of the war — for whom the Church remained a safe haven and bastion of community solidarity. Without the organized institution of the Archdiocese and subsidiary organizations, he could not sustain the loyalty of the new generation of Antiochians. Therefore, the Antiochians were the first in North America to establish the system of Archdiocese Conventions. The ﬁrst was in 1937. The second was in 1947 and thereafter on an annual basis, until changed under Metropolitan Philip's primacy to biennial events. SOYO (Syrian Orthodox Youth Organization), which has its roots in New England in 1938, later became a national movement spreading throughout North America. Its prime motivation was to knit together the fragmented youth groups in the United States and Canada. The regional conventions were a forerunner at the time to re-energizing the parishes on the local level. Archdiocesan publication The Word (1957), ﬁrst published as Al Kalimat under Bishop Hawaweeny, became the vehicle for reaching out to the homes; the Archbishop was its first editor-in-chief. The publication of liturgical books in English as well as choir books. The acceptance of a national and parochial consensus to establish the Board of Trustees, with a Constitution and By-Laws to govern the constituency, clergy and laity, and Church property. The Priest’s Guide, that serves to this day with some adjustments as a model for pastoral activities. One of the hallmarks of Bashir’s relationship with his clergy was how he “civilized” archaic and outmoded traditions foreign to North Americans. This booklet grew out of the ceaseless concerns for liturgical/ritual details at national Church gatherings — since 1937. Clergy education and training dominated both the Archdiocesan Conventions, Board of Trustees’ meetings as well as the Metropolitan's concern for the future of the Church in North America. Among the ﬁrst to provide scholarships to his students at Holy Cross and St. Vladimir’s Seminaries, he wanted to upgradethe quality from the early immigrant pioneers: each student had his tuition, room and board, plus a hundred dollar monthly stipend. Creation of a variety of departments and commissions, many of which are still active and thriving, that addressed the pressing needs of the Archdiocese. The Parish Assessment started with the “nourieh”. Later the dollar (81.00) per baptized soul in each community was mandated to ensure fiscal security for the Archdiocese. Most likely it was the Antiochians that established the first credentials accreditation system for the Clergy, Trustees, Churches and lay delegates. At the early assemblies, one was reminded of America’s political conventions. so heated were the debates and even the seating of the delegates. Regarding the clergy, there was constant attention paid throughout the years for their ﬁnancial stability, retirement and health disability/death beneﬁts. What began as a primitive wage scale gradually evolved over the years to what was at that time a more professional level. The creeping improvements paralleled the tensions and growth between the local Board of Trustees and their clergy. The designation: EO (Eastern Orthodox) on the identification tags of men and women in the armed forces. The Scouting movement, which gained recognition as a legitimate Orthodox enterprise. The recognition of Orthodoxy as the fourth major faith in the United States by Congress and State legislations. In 1937, he was the first Archbishop to open the session of the House of Representatives by prayer. Met with and stayed with President Franklin and Eleanor Roosevelt, as well as with General Eisenhower. In the 40’s, he was a dominant factor in forming the Federation of the Primary Jurisdictions of the Orthodox Greek Catholic Churches in America. In March 1960, he spearheaded the reorganization of the Federation into the Standing Conference of Orthodox Bishops of the Americas, which he served as Vice-President until his death. The memorandum that he circulated on March 15. 1960 to the Orthodox Hierarchs in North America was a landmark in lucidity and “vision” for the future. He was the first Orthodox bishop to Join the National Council of Churches and in December 1960 was elected National Vice-President. Time magazine, covering the Patriarchal election in 1958, cited Metropolitan Antony as a champion against the Communist plot originating in the Soviet Union to inﬁltrate and influence the outcome and, therefore, the very institution of the Patriarchate itself. This was during the “cold war” between the United States and U.S.S.R. Very early in the history of the Archdiocese he took it upon himself to make a personal commitment to support the Patriarchate ﬁnancially, although with a cautious eye. Collections for repairs for the Cathedral in Damascus, the Balamand Seminary and the Annual Palm Sunday collection for the Patriarchate were initiated and the seeds planted that have born fruit today with unparalleled commitments by our Primate to the welfare of the Mother Church and its institutions and clergy. In 1961 he pursued a course that stlrred great controversies, especially in the theological academies, with the establishment of a Western Rite Vicariate under Alexander Turner. He used the 1958 encyclical of Patriarch Alexander III as the raison d’étre for this bold stroke. Recognizing the rapid growth of his Archdiocese on the North American continent in 1960, he inaugurated the system of Deaneries to assist in his work. No matter how ambivalent he felt about the ultimate outcome, he set in motion the canonical process that would result in the election of an Auxiliary to the Metropolitan. Finally, he was the ﬁrst hierarch to boldly attack the policy of the United States government in the creation of Israel, in his public remarks at the 1948 Archdiocesan Convention. He protested the treatment of the Palestinian peoples and foresaw the unsettling conditions for peace in the region as a result. True to the Antiochian spirit, he aligned himself to the Pan-Arabism of his day. He saw no alternative. In 1957 he said: “The main cause of the Middle East problem is the presence of one million miserable desperate Arab refugees and there will never be peace as long as the refugees remain. It is the duty of the Christian world to do something about it.” Furthermore, he saw Nassar as the Arab George Washington in the Middle East. 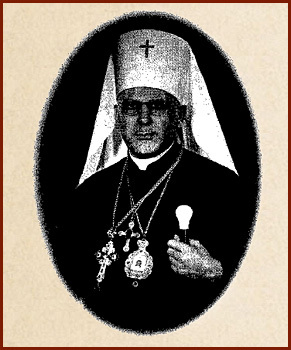 The Metropolitan's reﬂections on ecumenism spanned from his participation at the General Episcopal Convention in 1922 (the reason he came to America), to the Edinburgh/Oxford Conference in 1938, to the statement (first authored by Bishop Raphael in 1912 and affirmed by Aftimios in 1927) proclaimed by Antony in 1944 on the Protestant Episcopal ministrations, to the ecumenical rage of the sixties. The Archbishop was a sober realist, based on his experiences in both the Middle East and North America as to the possibilities of the reunion of Christendom. He nevertheless was in the vanguard as a supporter for the urgent necessity of a united front against what in those days was the assault on Christianity by communism and secularism. What he said and did could not have happened if Metropolitan Antony were a mystic from the East. In fact, he represented what is best in the spirit of the Antiochian tradition: he utilized his God-given intellectual and spiritual talents to immerse himself in his adopted country and culture. He incorporated in his person and acts what he perceived to be “useful" from the well-spring of Orthodoxy and married them to Western modalities. An unusual combination at that time, to say the least, when nostalgia was rampant for Holy Byzantium and Mother Russia. To conclude, I would be remiss if I did not brieﬂy touch upon the manner in which he handled the clergy and laity during this bridge period of the ancient Church and the new world. In private and public pronouncements, he was not above using the first person singular rather than the imperial “we” to press forward the confidence he held in his own position. His carefully crafted addresses were at once pastoral and direct. As a major transitional figure on the North American scene, Antony Bashir understood very well the necessity of both an educated and dedicated clergy and a highly visible laity that would form a working unit locally, regionally and nationally. ln assessing this aspect of his ministry, he knew instinctively that it was not his to work out all the “kinks” in the system. But he certainly laid the foundation that adjusted itself to a hierarchical Church in a democratic society, a system unknown to the rest of the Orthodox world still languishing under incipient political systems that inhibited independent action by the church. It was to his credit that he paved the way under tremendous odds. Yet he was in the right place at the right time, providing him with the conditions and resources to seize the moment and unleash an unstoppable force that provided the setting for our Primate to ascend his cathedral at an important juncture in the history of our Church in North America. In his own words, “We have come a long way” (1960). "We have come a long way together on a road that has many lights and a few shadows. If I were a proud man I could claim credit for all of the obvious good things that have marked my administration of this Archdiocese. If I simply wanted to please you, I could tell you that the good that has been done was accomplished with your help and that the mistakes had been mine. Of course, none of these statements are true in themselves. The achievements of this quarter of a century are yours and mine together. We must also share any mistakes that were made. Because of the distinctive constitution of our ancient church, the responsibility for everything is mine. And I am happy to bear it. But I do so with a deep and humble sense of gratitude to all of those, some now in the everlasting kingdom, and some still with us, whose prayers, and love, and labor and money, and also criticism, have ﬁlled my life work with the joy and satisfaction that come from a job well done." And so, Metropolitan Antony concluded his life with clarity and courage as a Prince of the Church in all dimensions. The mantle of greatness was placed upon another charismatic leader “to fight the good ﬁght," Metropolitan Philip, to lead the Church into the next millennium. Economos Antony Gabriel author of Ancient Church on New Shores: Antioch in North America and dealt extensively with the Bashir era. Other books authored by Fr. Antony include Gabriel's Dragons; Silence: A Diary of Suffering; and The Order of St. Ignatius Handbook. He is also Chairman of the Antiochian Heritage Foundation, recently retired from St. George of Montreal and Mc Gill University and has authored numerous articles in The Word Magazine and elsewhere. Fr. Antony is widely considered to be an engaging speaker on a wide range of subjects.